I know, I know…I haven’t posted in almost a week. I think that may be a record for me! But I think I had a pretty valid excuse. Our family also had another life-altering event: Marshall’s grandfather died. He was 92 years old. I’d only known him the past 10 years or so, as his health continued to decline. But even as things got more difficult for him and even when he couldn’t quite communicate what he wanted to, I never failed to feel a certain peace around Papa. All things I am not…and wish I were. In the years that I knew him, I rarely heard him speak. I remember one morning at his house, only he and I were in the kitchen. I’m not usually very good at sitting and being quiet, but something about his demeanor made the silence not only comfortable, but something I craved. Papa died a few days after my surgery. As we were preparing to make the drive for the funeral, we got word that several family members had a terrible stomach virus. Weary of anything that might cause an upset to my recovery, we all agreed it was best if the children and I didn’t go. And although I’m glad to be germ-free, there’s a part of me that wishes I’d gone. I’ve never been good with closure. Death, no matter how expected and no matter what age, tends to pull the rug out from under your feet, doesn’t it? But he lived a good life. He was happy. More than happy, he was content. Papa was a proud WWII Army Veteran who found himself far, far from south Georgia when he landed on Normandy beach. He was a dedicated husband and father. He was the Postmaster of his then-tiny town for years. Proud of his heritage, he was a member of the Georgia Salzburger Society. And I recently learned something that I’d never known about Papa: he was one of the founding members of the local fire department back in the 1950s, and he was fire chief in the 1960s. To honor Papa, the local fire department did something I’ve never seen before. They put two trucks on either side of the road and use the extended ladders to form an arc across the roadway. You can see the display in the video here. Big messy tears here. How amazing and absolutely beautiful. You don’t need to see a picture of him or hear one word about him. That gorgeous procession says it all. Absolutely amazing. Thanks, Bridget, for this beautiful tribute to dad. He was a wonderful man. We are all going to miss him. But he is at peace and with mom and all his family/friends who have gone on before him. Our faith will get us through. I’m sorry you didn’t get to come – I know you wanted to. But that virus was wicked and I would have felt awful had you picked it up. I know you were there in thought and prayers. Thanks again for this beautiful tribute. OH, I cry…What an awesome tribute to, clearly, an incredible human. Oh honey, I’m so sorry. Will be thinking about you and Marshall. It is amazing what you find out about that very proud and humble generation after they pass. 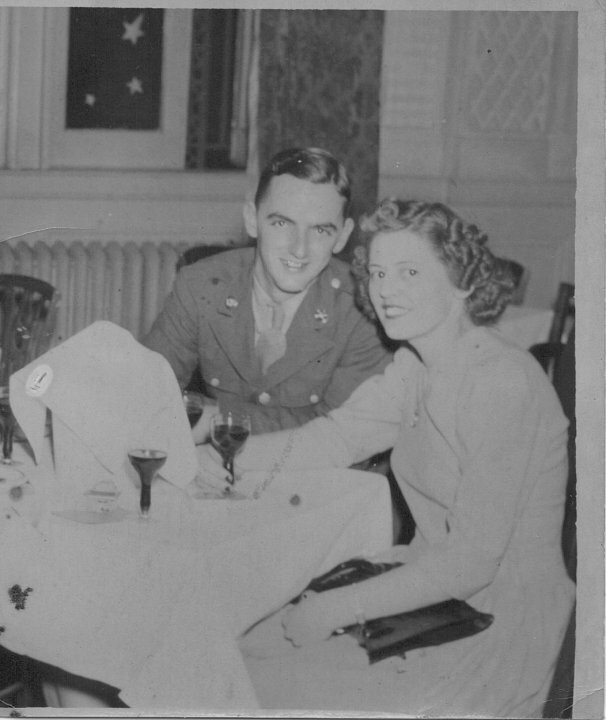 I found out so many wonderful things about my grandparents at their funerals. I wish I had have really known them.